It wouldn’t be Christmas if there were no surprises. At castillo/corrales, this takes the form of an extra exhibition squeezed in the calendar and new seasonal opening hours for the bookshop. Opening on Wednesday December 17th, castillo/corrales hosts Tif’s Desk, for an original presentation of the work of Albert Mertz. Between sometime in the early 1960’s and up until 1976, Albert Mertz resided in Savigny-sur-Orge, a thirty-minute train ride from the center of Paris. But Mertz never really got ready to leave for the party and chose to spend this lengthy residency abroad from his native Denmark at home, looking, thinking, writing, and smoking Gauloises cigarettes. He much prefered listening to the party from his studio. 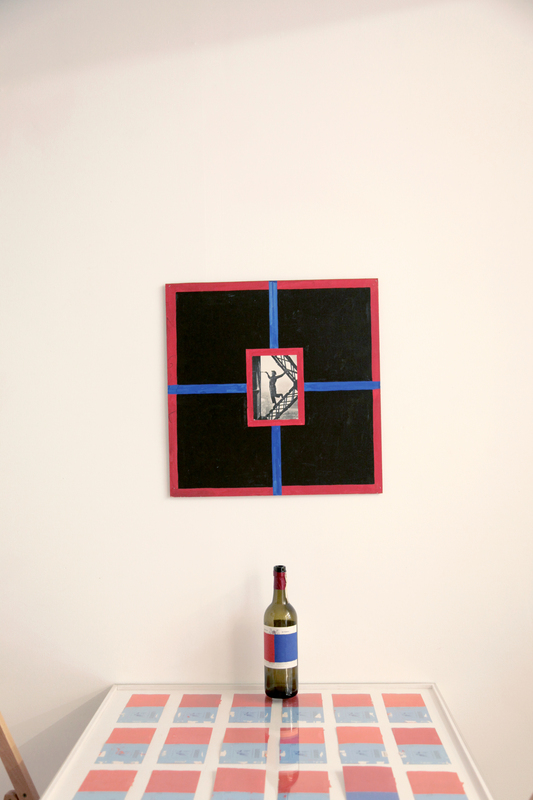 In his own completely offbeat way, Mertz chose to apply the colors red and blue to an array of objects (chairs, paper, televisions, canvases), and he sticked to this idea up until his last days in 1990. 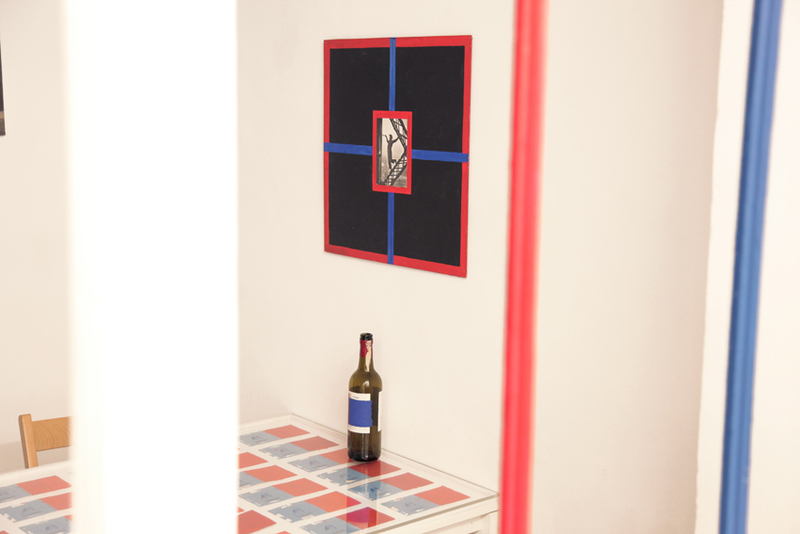 Presented here are 33 Gauloises cigarette wrappers painted red and blue, a bottle of French wine whose label is painted red and blue, and a canvas with a collaged postcard of Buster Keaton at the Eiffel Tower. There were many things to choose from Mertz’s vast corpus of works; but these seemed best for this place. 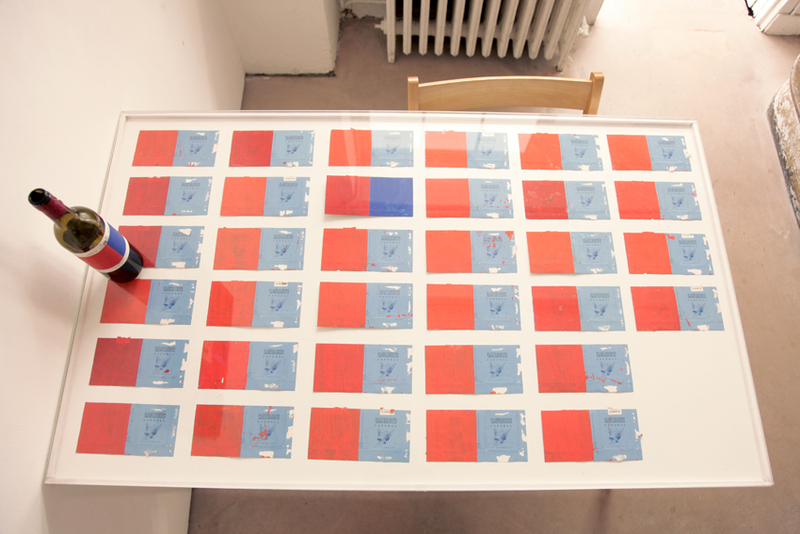 Tif’s desk originated as a project space in the office of Thomas Solomon Gallery (Los Angeles) in 2011. Situated in gallery director Tif Sigfrids’ desk, Tif’s Desk hosted rotating exhibitions in tandem with the regular gallery program. Mobility, as a function of the desk’s Ikea build, has made it possible for this program to continue in a variety of locations including apartments, art fairs, and now for the first time internationally. 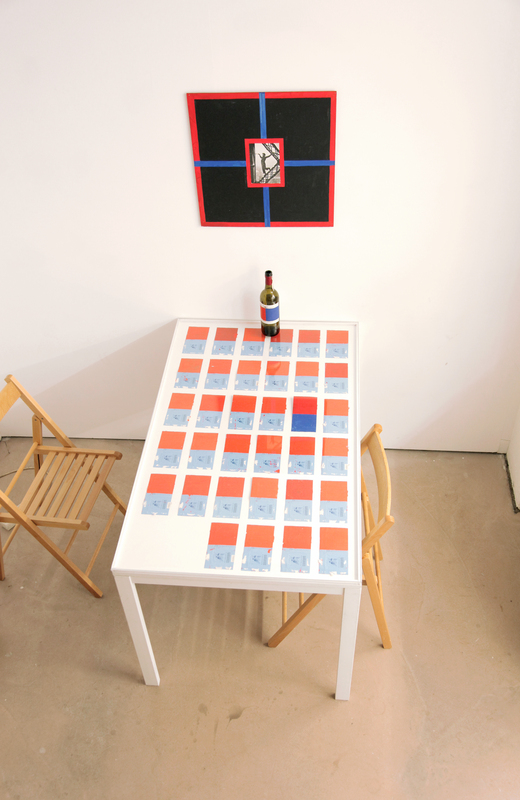 Tif’s Desk cabinet-like exhibition runs parallel to Duncan Hannah’s solo show “Paris,” still on view at castillo/corrales.